I’m happy to introduce my new seashell mosaics.Their creation became a new experience for me. Sea shells are unique nature material but nobody tried before to use it for expression a theme of Jewish life. I had just a dream that in some day it can happen. 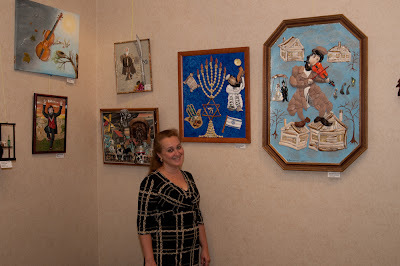 The reason for these four three dimensional seashell mosaics and collages was exhibition “Jewish Heritage: Art for children” and 150 years Anniversary of Sholem Aleichem Birthday in 2009. 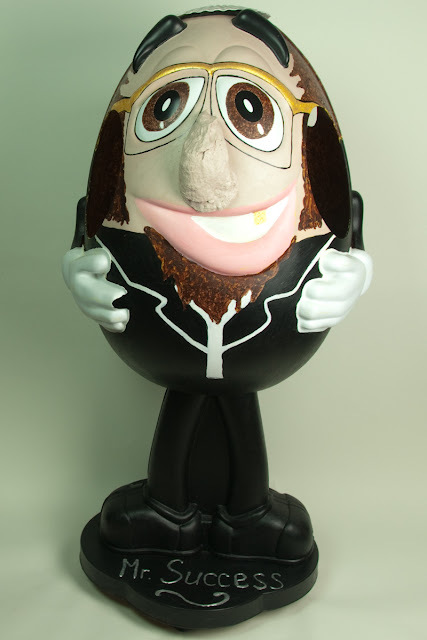 This exposition took place in Bnai Zion, New York. I was inspired by his novels I have read and also my personal experience with the very emotional stories which I remember from my grandmother. She was born in 1900 in Belarus in shtetl with name Chernevka in czarist Russia and knew suburban Jewish life very good. 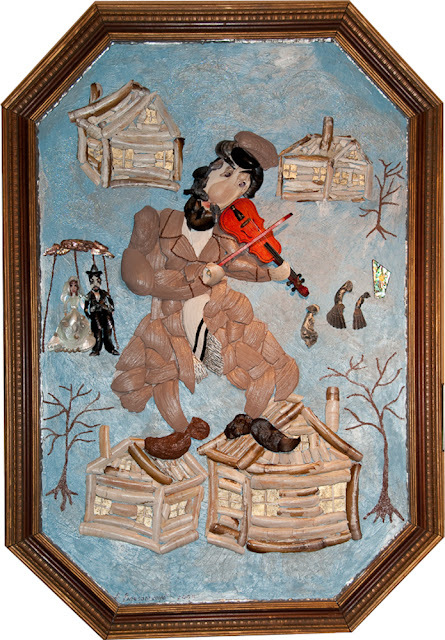 The first of my seashell collage is “Fiddler on the Roof”. I tried to realize a very difficult and time consuming project to show fiddler like a major person in an old style Jewish everyday life. Sea shells were a very unusual and interesting material to reach my goal. Fiddler played and supported people in their happy and tragic days. I tried to recreate a special atmosphere in which Jewish people lived. This work received also First Place Blue Ribbon Award during New Jersey Seashell Show in 2009. The second seashell mosaic is “Judaic for kids”. 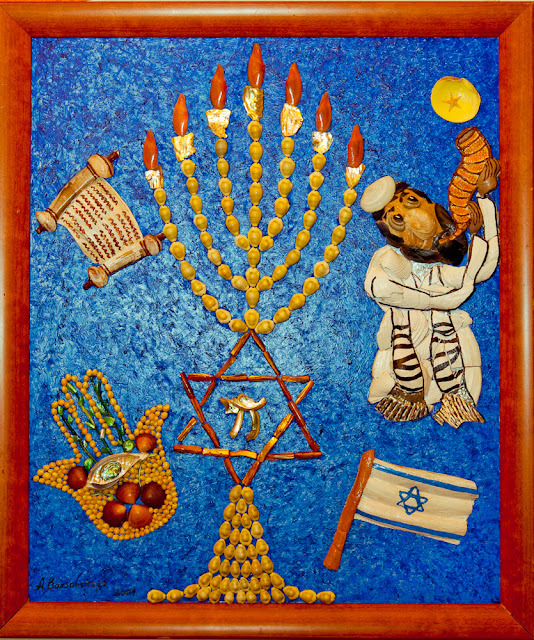 All Sacred Jewish items are made from the original color different types of seashells.The base of the work was painted with an acrylic painting. The third work is collage. I tried to imagine the face of the shtetl man. I made a wise, sad, not young, but very experience man. Combination of two natural materials like wood and seashells bring realistic warm expression. The fourth work made for the same event was a statue of Mr. Success Rabinovich. This is a very famous and humorous character among Sholem Aleichem novels. This figurine has wheels and big storage space inside. 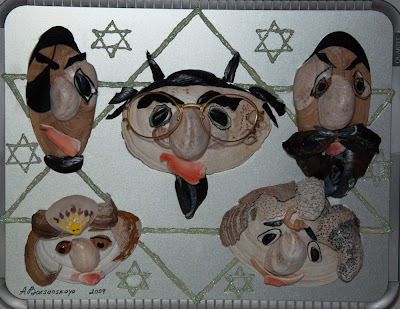 The fifth and sixes works about Jewish life were made in 2010. 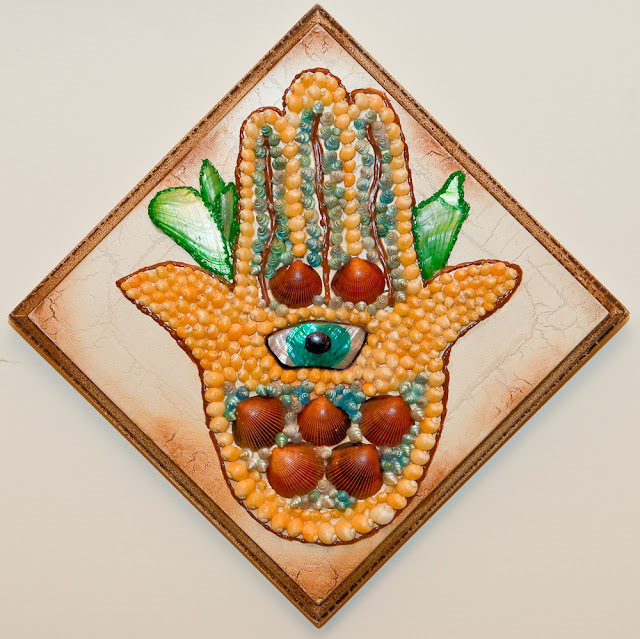 The fifth seashell mosaic named “Hamsa”.This a special Judaic Sacred Symbol. 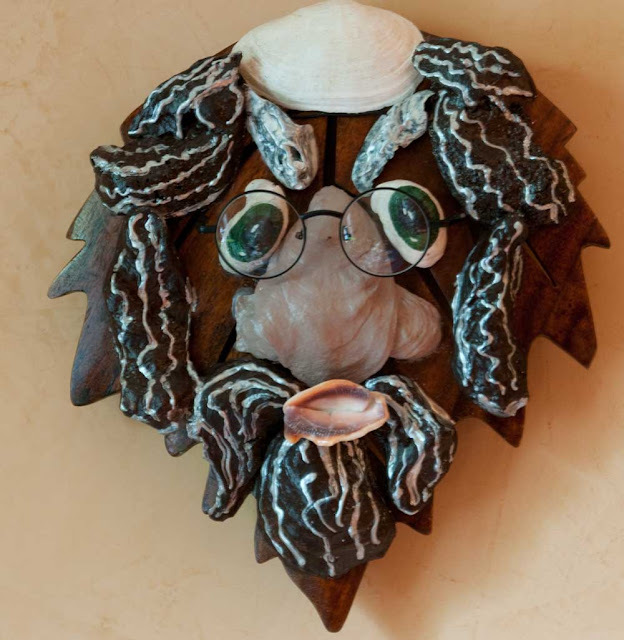 The sixes seashell collage was named “Prejudice”. This is a funny example how some other people think and feel about Jewish people. I try to show all prejudice: the man in the middle is clever like hell, the man on the left is cheater like pirate n and so on.